At the beginning of June Sri Chinmoy lifted the world’s smallest horse, Thumbelina, weighing just 57 pounds. On Saturday, the last day in June, the 75-year old fitness champion and harmony leader went to the other end of the scale, lifting 2540 lb Radar, who is the Guinness world record books as the tallest horse in the world. In this lift, Radar stood on a platform as Sri Chinmoy performed a calf raise lift as shown in the photo above. 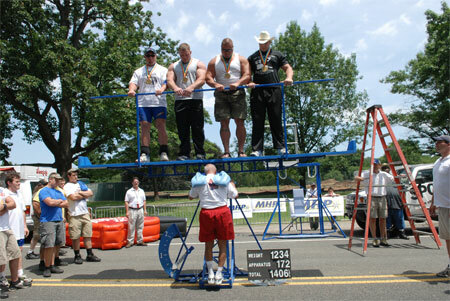 Then his handler, Charles Wood, stood on the platform with Radar as Sri Chinmoy performed a second lift – including the apparatus, the total weight for this lift came to 3966 pounds. Sri Chinmoy frequently honours men and women who have been an inspiration to the world by lifting them as part of an award program called ‘Lifting up the World with a Oneness-Heart’ – in the same way, Sri Chinmoy also says that Radar has been an inspiration to him: “Radar is the tallest, so Radar gave me the inspiration to set my goals to the highest”, said the 75-year old fitness champion. Sri Chinmoy also wrote 2 songs in praise of Radar which were performed at the event. The very next day, Sri Chinmoy was in Philadelphia at the Liberty Strongman Classic, where many of the world’s strongest men were gathered for a unique ‘Team USA’ versus ‘Team World’ strongman competition. To show his appreciation for the contestants on both sides, Sri Chinmoy lifted eight of them overhead with his right arm, as one by one they stood on an overhead platform. Then all the members from each team ascended onto an overhead platform as Sri Chinmoy lifted them all together using a calf raise. In this photo we see all the Team USA members being raised in this manner. 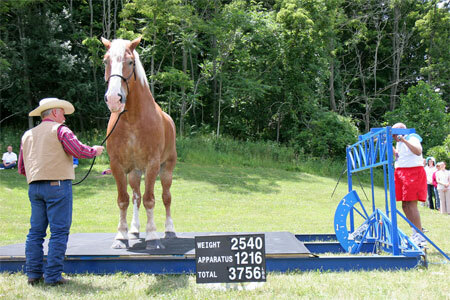 The biggest horse that i have sat on was a 19hh Shire at Devon County Show. I have a Grey Arab X Conomara Gelding and i love him to bits.